Growing front office adds new groundskeeper, members of special events, community relations, and operations staff. CHARLESTON, S.C. - As crowds filing into The Joe continue to grow each year, so does the RiverDogs front office staff. 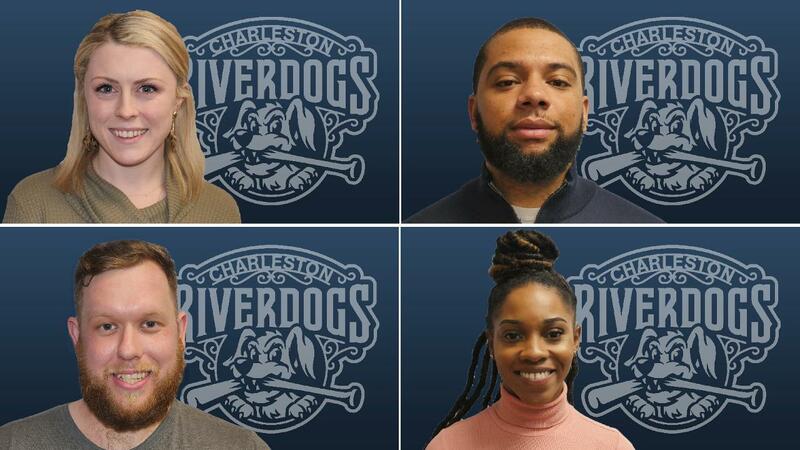 RiverDogs President and General Manager Dave Echols has announced the hires of four new members to the Charleston front office, naming Kevin Coyne Head Groundskeeper, Kris Bennett as the Community Relations Assistant, Kayli Varner as the Special Events Manager, and Jordan Wiley as Operations Manager heading into the club's 2019 campaign. Coyne takes over as the RiverDogs' next head groundskeeper after working on the field crew for the Minnesota Twins for the past four seasons at Target Field. Prior to his Big League stint, the Minnesota native worked as the Assistant Field Superintendent with the San Antonio Missions of the Double-A Texas League. "Kevin has an excellent track record as a top-notch sports turf manager at both the Major League and minor league levels, and we're excited to bring one of the young talents in the business to maintain our high standards of excellence for the field at The Joe," remarked Echols. Bennett will work with Walter Nolan-Cohn as the second member of the RiverDogs' community outreach efforts. The South Carolina native is a current resident of Charleston, most recently working as an on-air personality with 93 Jamz and Cumulus Radio in the Lowcountry. The South Carolina State grad's previous experiences include a stay as a public relations specialist at her alma mater and as a social media specialist and freelance videographer. "The RiverDogs are enthusiastic to bring Kris's unique skillset aboard as we continue to expand our footprint in the Charleston community," said Echols. "Our fans will connect with her engaging personality and her experience with social media will help give our fans a unique look at what the RiverDogs are up to throughout the Lowcountry community." Varner makes a return to Riley Park after interning with the RiverDogs during their record-setting 2017 season. The University of Georgia alum helped in the club's community outreach efforts during that year. Varner will work in tandem with the RiverDogs' Director of Special Events, Lisa Dingman, in filling out the club's year-round schedule of non-baseball events ranging from the annual Ballpark Festival of Beers, Hot Stove Banquet & Auction, food festivals, concerts, and more. "Kayli stood out among our 2017 intern class and we're happy to bring her aboard on a full-time basis to help grow our special events department," said Echols. A native of Irmo, S.C., Wiley will join Josh Otterline as the second member of the ballpark operations team after Otterline took over as director of the department in the midst of the RiverDogs' successful 2018 campaign at the gate. Wiley most recently worked as a member of the Carolina Panthers' Football Operations Training Camp team, where he assisted in moving the Panthers from Bank of America Stadium to Wofford College heading into the season. The Winthrop University grad's previous experiences include an internship at the Charlotte Motor Speedway and as a Guest Relations Associate at Bank of America Stadium. "As crowds at The Joe continue to expand each season and we look ahead to our operational needs to get the most out of one of the best ballparks in the minors, we're excited to continue to grow our staff with an ambitious and hard-working individual like Jordan," said Echols.